Synthetic peptide within Human Nrf2 (phospho S40). The exact sequence is proprietary. WB: HepG2 whole cell lysate (ab7900). IHC-P: Human tonsil, breast carcinoma, ovarian carcinoma and cervical carcinoma tissue. ICC/IF: HepG2 cells. Flow Cyt: Jurkat cells. Our Abpromise guarantee covers the use of ab76026 in the following tested applications. WB 1/5000 - 1/50000. Predicted molecular weight: 68 kDa. Flow Cyt 1/80 - 1/100. Immunohistochemistry (Formalin/PFA-fixed paraffin-embedded sections) - Anti-Nrf2 (phospho S40) antibody [EP1809Y] (ab76026)Inui et al PLoS One. 2013 Sep 24;8(9):e74398. doi: 10.1371/journal.pone.0074398. eCollection 2013. Fig 2. 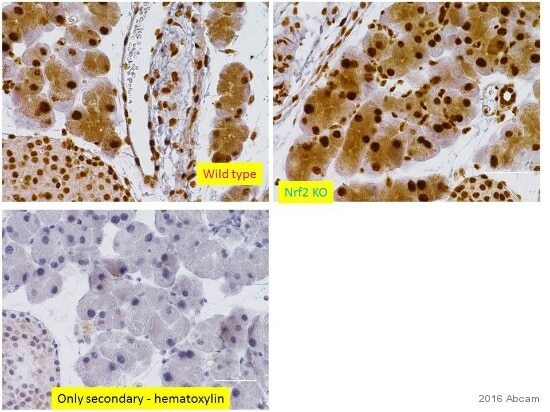 Nrf2 was abundantly expressed in carcinomas, low grade dysplasias, and non-atypical epithelia of oral tissue. Representative findings of Nrf2 staining in carcinoma (left), in low grade dysplasia (middle), and in non-atypical epithelium (right). Corresponding PLA signals are displayed in the lower row. Scale bar; 100 µm. Surgical specimens were transferred to 10% buffered formalin and fixed overnight. The fixed samples were embedded in paraffin, and serially sliced into 5 µm sections. After dewaxing, sections were autoclaved at 120°C for 1 min in 10 mM sodium citrate buffer (pH 6.0), and immersed in 0.3% H2O2. They were then incubated overnight at 4°C with primary antibody to Nrf2 (diluted 1:200). 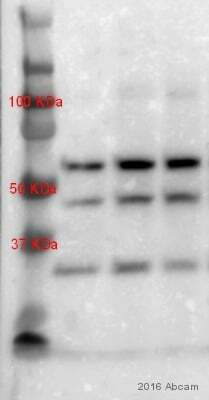 The sections were rinsed with 1×PBS and incubated with the secondary antibody conjugated with horseradish peroxidase at room temperature for 1 hour. The sections were then stained with 3.3′-diaminobenzidinetetrahydrochloride (DAB) and counterstained with hematoxylin. Immunocytochemistry/ Immunofluorescence - Anti-Nrf2 (phospho S40) antibody [EP1809Y] (ab76026)Giyshi et al PLoS Pathog. 2014 Oct 23;10(10):e1004460. doi: 10.1371/journal.ppat.1004460. eCollection 2014 Oct. Fig 1. Immunofluorescence analysis of Nrf2 levels in Kaposi's sarcoma skin lesions. B) Healthy skin (top two rows) and KS skin tissue (bottom row) were double-stained for LANA-1 (Alexa-Fluor 594- red) and host phosphorylated pNrf2 (ab76026) (Alexa-Fluor®488 – green). DAPI was used to visualize the nuclei, and the triple merge of LANA-1, pNrf2 and DAPI is shown in the third column. Yellow square = enlarged area. Immunocytochemistry/ Immunofluorescence - Anti-Nrf2 (phospho S40) antibody [EP1809Y] (ab76026)Masuda et al PLoS One. 2015 Jun 25;10(6):e0131012. doi: 10.1371/journal.pone.0131012. eCollection 2015. Fig 1. Nrf2 Translocation from cytoplasm to nucleus. Immunohistochemical staining of paraffin embedded human breast carcinoma with purified ab76026 at a working dilution of 1/500. The secondary antibody used is HRP goat anti-rabbit IgG H&L (ab97051) at 1/500. The sample is counter-stained with hematoxylin. Antigen retrieval was perfomed using Tris-EDTA buffer, pH 9.0. PBS was used instead of the primary antibody as the negative control, and is shown in the inset. Immunofluorescence staining of HepG2 cells with purified ab76026 at a working dilution of 1/100, counter-stained with DAPI. The treated cells were treated with alkaline phosphatase for 1 h at 37°C. The secondary antibody was Alexa Fluor® 488 goat anti-rabbit (ab150077), used at a dilution of 1/1000. ab7291, a mouse anti-tubulin antibody (1/1000), was used to stain tubulin along with ab150120 (Alexa Fluor® 594 goat anti-mouse, 1/1000), shown in the top right hand panel. The cells were fixed in 4% PFA and permeabilized using 0.1% Triton X 100. 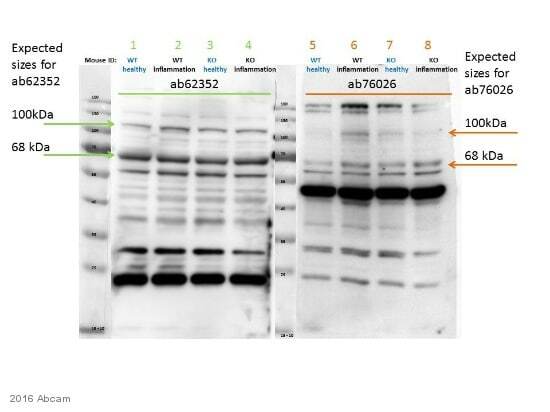 The negative controls are shown in bottom middle and right hand panels - for negative control 1, purified ab76026 was used at a dilution of 1/500 followed by an Alexa Fluor® 594 goat anti-mouse antibody (ab150120) at a dilution of 1/500. 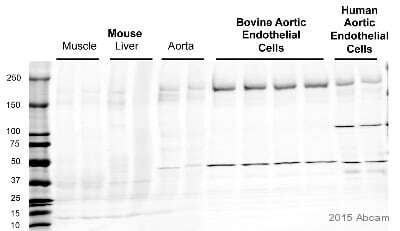 For negative control 2, ab7291 (mouse anti-tubulin) was used at a dilution of 1/500 followed by an Alexa Fluor® 488 goat anti-rabbit antibody (ab150077) at a dilution of 1/400. Overlay histogram showing Jurkat cells fixed in 4% PFA and stained with purified ab76026 at a dilution of 1 in 80 (red line). 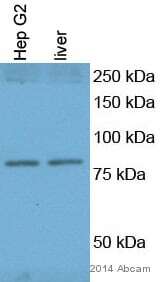 The secondary antibody used was FITC goat anti-rabbit at a dilution of 1 in 500. Rabbit monoclonal IgG was used as an isotype control (black line) and cells incubated in the absence of both primary and secondary antibody were used as a negative control (blue line). 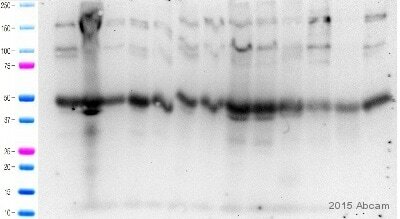 Dot blot analysis of Nrf2 peptides using unpurified ab76026 at 1/1000 dilution followed by Goat Anti-Rabbit IgG, (H+L),Peroxidase conjugated secondary antibody at 1/1000 dilution. Blocking and diluting buffer was 5% NFDM/TBST. Immunohistochemical analysis of paraffin-embedded human breast carcinoma using unpurified ab76026 at 1/100 dilution. Lane 2 : HepG2 (human hepatocellular carcinoma) treated with Alkaline Phosphatase (AP) whole cell lysates 20µg. Unpurified ab76026 staining Nrf2 (phospho S40) in Human normal lung tissue sections by IHC-P (Formaldehyde-fixed paraffin-embedded sections). Tissue was fixed with formaldehyde and blocked with 1% casein for 30 minutes at 4°C. Antigen retrieval was by heat mediation. Samples were incubated with primary antibody (1/50) in 1% casein for 24 hours at 4°C. An undiluted HRP-conjugated Goat polyclonal to rabbit IgG was used as the secondary antibody. Unpurified ab76026 showing positive staining in Breast carcinoma tissue. Unpurified ab76026 showing positive staining in Cervical carcinoma tissue. Unpurified ab76026 showing positive staining in Ovarian carcinoma tissue. Unpurified ab76026 showing positive staining in Normal tonsil tissue.